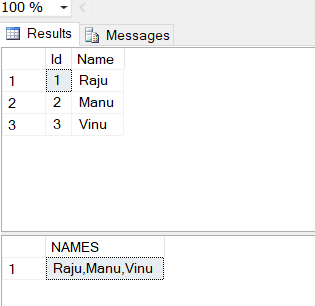 From the above query it will replace Hi to Mr. You can use the STUFF with XML Path for concatenate the column data easily. To handle this exact scenario, MS introduced new functionality called STRING_AGG in SQL 2016,2017. STRING_AGG Concatenates the values of string expressions and places separator values between them. I believe this would be help full method for what you are trying to accomplish with the XML/STUFF method.